This coming week, on October 31st - November 2nd, the Church will be celebrating the Hallowed Days (also known as "Days of the Dead"). As we celebrate these feasts, we remember all those who have gone before us, whether they are recognized by the Church as saints or not. First we have Halloween on October 31st. The name Halloween is shortened from All Hallows' Eve, since it is the eve of All Hallows' Day (also known as All Saints' Day). Next, on November 1st we celebrate the actual feast of All Saints -- this includes all the Saints that have not been canonized and are unknown to us. Then, on November 2nd, we celebrate the feast of All Souls. This day is officially set aside to remember and pray for the poor souls in Purgatory. How, or even whether, to celebrate Hallowe'en is a controversial topic in traditional circles. One hears too often that "Hallowe'en is a pagan holiday" -- an impossibility because "Hallowe'en," as said, means "All Hallows' Evening" which is as Catholic a holiday as one can get. Some say that the holiday actually stems from Samhain, a pagan Celtic celebration, or is Satanic, but this isn't true, either, any more than Christmas "stems from" the Druids' Yule, though popular customs that predated the Church may be involved in our celebrations (it is rather amusing that October 31 is also "Reformation Day" in Protestant circles -- the day to recall Luther's having nailed his 95 Theses to Wittenberg's cathedral door -- but Protestants who reject "Hallowe'en" because pagans used to do things on October 31 don't object to commemorating that event on this day). Eileen shares her families traditions and celebration from last year. I just love the All Saints Tea Party she had for her children, and the Flaming Cupcakes look like so much fun!! Take the Nutter Butter cookies and dip them in melted almond bark. Use mini chocolate chips for the eyes. Let set on waxed paper. Sarah shares a wonderful post filled with suggestions and links for these upcoming feasts. Although it isn't a recipe, I was very impressed with her link to the All Saints and All Souls Day Tree. I think we might just have to make one this week! I plan to head back to her blog since she was also shared ideas for some other upcoming feasts later this month! I am always inspired by Mary over at Our Domestic Church (and a contributor here at Catholic Cuisine as well!). 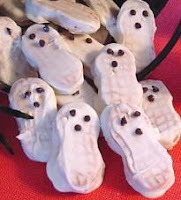 She is very creative, and I just love the recipes that she posted for celebrating All Souls Day. The Sugar Skulls look like so much fun to make, the recipe for Pan de Muerto (a Mexican sweet bread frequently flavored with orange and/or anise) sounds delicious, and her Calacas Cupcakes have got be the cutest skeletons I have ever seen! Lisa from Creekside Wonder shares a number of their traditions with us including: a recipe for Albondigas (a traditional Mexican Meatball Soup), making Calacas (Sugar Skull Cookies--you can see their finished cookies here), and a beautiful picture of their completed home altar in honor of their departed loved ones. There once was an old drunken trickster named Jack, a man known so much for his miserly ways that he was known as "Stingy Jack," He loved making mischief on everyone -- even his own family, even the Devil himself! One day, he tricked Satan into climbing up an apple tree -- but then carved Crosses on the trunk so the Devil couldn't get back down. He bargained with the Evil One, saying he would remove the Crosses only if the Devil would promise not to take his soul to Hell; to this, the Devil agreed. After Jack died, after many years filled with vice, he went up to the Pearly Gates -- but was told by St. Peter that he was too miserable a creature to see the Face of Almighty God. But when he went to the Gates of Hell, he was reminded that he couldn't enter there, either! So, he was doomed to spend his eternity roaming the earth. The only good thing that happened to him was that the Devil threw him an ember from the burning pits to light his way, an ember he carried inside a hollowed-out, carved turnip. Preheat oven to 300° F. Toss pumpkin seeds in a bowl with the melted butter or oil and any optional ingredients of your choice. Spread pumpkin seeds in a single layer on baking sheet. Bake for about 45 minutes, stirring occasionally, until golden brown and crispy. Store airtight. Option: If you roast them without any of the above optional flavorings, you can now flavor them Spicy-Sweet by doing this: Heat a TBSP of peanut oil in a skillet, add 2 TBSP sugar, and the seeds. Cook the pumpkin seeds over medium high heat for about 1 minute or until the sugar melts and starts to caramelize. Place pumpkin seeds in a large bowl and sprinkle with this mixture: 3 TBSP sugar, 1/4 tsp. salt, 1/4 tsp. cinnamon, 1/4 tsp. ginger, and a pinch of ground cayenne pepper. One of our favorite traditions is actually carving Saint-O-Lanterns rather than Jack-O-Lanterns. In fact my children are always discussing what they hope to carve months in advance. This year my boys are planning on trying to carve the Sacred Heart of Jesus and the Ascension! We are going to miss Regina and her family at our All Saints' Party this year, since they recently moved. It has always been fun competing against them in our local Saint-O-Lantern carving contest. (Though the new coordinators decided to not have the competition this year.) You have to go and check out their pumpkins from last year: A Girl Receiving her First Communion and the Nativity. Also, while you are there, don't miss the one her husband carved a few years back of Pope John Paul II. The picture really doesn't do it justice. It was amazing! Totus Tuus Family recently posted a picture of their beautiful Pumpkin Monstrance. Be sure to click her link to see the yummy looking Pumpkin Pancakes and Hot Apple Cider Sauce that they enjoy during this season. Yummm! Island in the Grove also shares an excellent idea for converting any of your All Hallows' Eve Jack-O-Lanterns for the feast of All Saints'. In Catholic Traditions in Cooking, author Ann Ball says that "chestnut dishes are the traditional food in Italy. These dishes are of many sorts, from stuffing's for roasts to cakes and candies." I was excited to see that Jennifer Miller also shares some Italian recipes for these Hallowed Days over at her food blog Family Food for Feast and Feria. The "Chestnut Fritters" sounds absolutely divine, and the "Beef Stew in a Pumpkin Shell with Potato-Pumpkin Puree" sounds delicious as well. I am very intrigued and just might have to order that cookbook she recommends! While your there, don't miss clicking on the links to her past articles. They are very inspiring! To finish up, I myself have been pouring through some of my favorite Catholic cookbooks these past few weeks, searching for ideas and recipes to incorporate into our own celebration. I compiled a post with ideas for Fasting and Feasting for All Hallows' Eve, All Saints' and All Souls Day over at my blog, Shower of Roses. We hope you have enjoyed the fair. Thank you to everyone who participated!! If you have contributions to add, I'll continue to take submissions and insert them into the fair. God Bless! "The glorious company of the apostles praise Thee. O Blessed Trinity, one God!" I just wanted to post a quick reminder for the upcoming From Thy Bounty Fair that will be posted this coming Monday, October 27th, here at Catholic Cuisine. Florence Berger writes in Cooking for Christ: “The doctrine of the mystical body unites all Christians to their Master, and one with the other in God's kingdom here on earth. As the branches have their source in the vine, so with Christ we have been bound together for growth and fruition.” The Feasts of All Saints Day (preceded by All Hallows Eve) and All Souls tie together and help us remember the Church Militant, the Church Suffering, and the Church Triumphant. These days offer many unique traditions and celebrations. Share how you feast any of these days? What do you do to fill your tables with the traditions of these hallowed days? Submissions are encouraged and welcome from everyone, both bloggers and non-bloggers. Please submit your blog links, pictures, recipes or ideas to me by Sunday night. Past posts are welcome as well. I'd love to hear all your ideas, so don't be shy!!! I know that none of the moms who read this blog are ever guilty of this sort of behavior but I thought I would ask just in case you know someone who is. Ever tossed a bunch of paper plates and forks in the middle of the table and let everyone grab for themselves? Have you planned a meal around the fact that you don’t want to do dishes? Has your six year old ever had a drink from an actual glass? I know it sounds funny and these are fairly extreme examples but the truth is that when you have a large family or a bunch of very small children or children involved in sports, the practice of dining at home becomes closer to a scene in a fast food restaurant than a homey evening in the bosom of your family. As devout Catholics who are concerned with the observance of our faith and the preserving of close ties among our children meals together in pleasant surroundings should be our goal most nights. Dining is a very important part of the family experience and it should be our aspiration as moms and homemakers to, every evening it’s possible, to set a beautiful table and make our food as appealing as possible. We also should be teaching our children the importance of beauty and order at the dinner table. Before I continue I want to stress that I don’t pull this off nearly as often as I would like. My husband and I often marvel at our children’s capacity to act like a bunch of Klingons at the dinner table and there is the presence of plastic sippy cups more often that I would like to admit. It is also a rare occurrence to have dad home for dinner during the week. He often works past the time I am willing to be in the kitchen. However it is nearly always possible on the weekends and even if dad is not home it’s a habit worth developing; setting a nice table, taking time to eat slowly and enjoy what has been prepared; observing good manners and enforcing them at your table. Toward that end here are some basics that might help you get started. It is appropriate at dinner time to cover the table in a white, cream or pastel colored table cloth. When you have small children place mats might be more practical but make sure they are made of cloth and are of a color that will not compete with your food or décor. Choose napkins that are harmonious in color to the scheme and are easily washable. 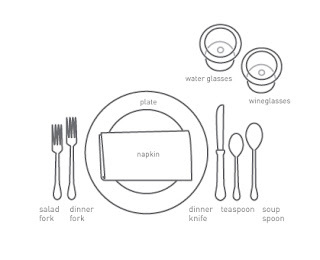 The napkin, folded in a square or rectangle, with the open corner at the lower right, is placed on the plate. If the first course is already plated then the napkin goes just to the left of the fork with the open ends lined up to the fork. Knives are at the right of the plate with the sharp edge facing the plate. Butter knife is placed at the top and lying across the bread and butter plate. Beverage and soup spoons are at the right of the knife. Forks are to the left of the plate. Salad forks are to the left of the dinner fork when salad is the first course. If salad accompanies dinner to the table then the dinner fork is used for both. Water glass or goblet is placed directly above the point of the knife. Cups and saucers are placed at the right of the spoons with handles facing to the right. A salad plate is placed to the left of the forks. Dinner plates are in the center of the setting one inch from the edge of the table. When soup or salad is the first course the bowl or plate should be placed upon the dinner plate. For an informal family dinner it is pleasant to have a centerpiece if you have the room and are so inclined, just keep it simple. A few flowers from your garden or something the children have made. Autumnal centerpieces can be very easy to put together quickly. A bowl of autumn leaves or found acorns and pinecones would be very pretty. If you use candles do make sure they are of the unscented variety so as not to interfere with the aroma and enjoyment of your meal. Although most families have moved away from the tradition of plating a first course, if you have time it is a nice way to begin a meal. Have the salad in bowls and on the plates before calling the family in to eat. To have a change of pace you could substitute soup in small cups or mugs or even a glass of cold vegetable juice garnished with celery. A cold fruit plate is also a nice change. It will, at the very least, spark some conversation. When ready for the main course the first course is quickly and quietly cleared and the main dish is put before the head of the household (Dad if he is home) and he serves the meal to the left. Family members pass their plates to Dad and he dishes things up. The alternate family style is to place all of the food on the table, in serving dishes or platters, and allow each person their turn. In a large family this can turn into a free-for-all so make sure that everyone knows to always pass to the left. It is correct to serve and remove all dishes from the left and all beverages at the right. The most important thing to remember is to make meals a special time in your home, a time which your children will remember fondly and try to re-create in their own homes someday. Try to come to the table as a relaxed, happy mother and the whole atmosphere of the meal will follow. Next time we’ll tackle table manners. Since St. Teresa of Avila was born in the Castile region of Spain, I thought it would be fun to try and combine some regional Spanish cuisine into our menu for her feast. One of the more common foods from Castile is Garlic Soup. From what I read, it was often eaten, about 3 hours after breakfast, on winter mornings, to help recover form hard work and the cold. 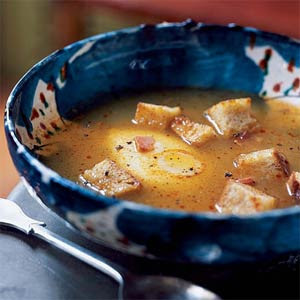 I ran across many recipes for this soup, but decided to try the following one from Cooking Light Magazine. Originally, garlic soup was a peasant's dish made with the most basic ingredients: garlic, bread, and water. Traditional additions of broth, spices, ham, and poached eggs made much tastier soup. The cooked egg whites give the soup a cloudy appearance. To prepare the croutons, combine 1 1/2 teaspoons oil and 1 crushed garlic clove in a large bowl. Add the bread cubes, tossing to coat. Place bread cubes in a single layer on a baking sheet. Bake at 350° for 12 minutes or until toasted. Sprinkle bread cubes with 1/2 teaspoon paprika; toss well. Break 1 egg into each of 4 ovenproof bowls. Divide the broth mixture evenly among bowls. Place bowls on a baking sheet. Bake at 450° for 15 minutes or until the eggs are set. Top each serving with croutons. 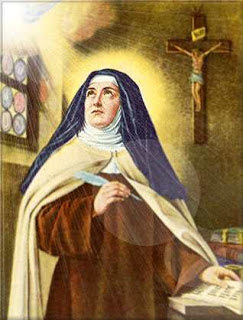 October 15th is the Feast of St. Teresa of Avila, a great saint and Doctor of the Church. For her feast this year, I am planning on making Pan de Santa Teresa (St. Teresa's Bread), a yummy looking recipe found in A Continual Feast by Evelyn Berge Vitz. "This dish, named after St. Teresa of Avila, makes a tasty breakfast or brunch especially for children. It is a first cousin to French toast, but with a flavor and texture all its own." Saint Teresa of Avila ~ Pray for us! Today at Catholic Cuisine we rejoice in the Lord, as we enjoy and share glimpses into the harvest happenings in our homes. Fall, because of it's focus on harvest and preparation for the winter, has traditionally been a time for giving thanks for the bounty of gifts we have received. Whether that bounty is grown in the field or orchard or hunted on the land we rejoice in God's goodness and generosity. Enjoy the fruits of this fair. We hope it holds ideas for you to use with your bounty. Ana Braga-Henebry's Journal deliciously chronicles the entire harvest of the bounties of their splendid garden over the last several months. From this week's yummy pesto back through their season of fruitful harvesting, you can see the joy this abundance has brought them. Jessica’s gang had an opportunity to share in the harvest of plums at the home of their priest earlier in the season. There is so much joy in the faces of these little harvesters - truly a reminder to enjoy these gifts with the heart of a little child. And here is the recipe for plum cobbler that they made with them. Looks delish! Fruits of the vine, a product that is very much a part of our faith. Michaela shares the abundance of the fruits of her grape vine. A harvest being enjoyed by many. When talking about the fruits of the harvest here in North America, no discussion it seems would be complete with mention of apples and pumpkins. They seem almost synonymous with autumn bounty. Jenn first reflects with gratitude on the bounties of her own garden (tomatoes) and of the nearby community farms (apples & pumpkins). It has given her a time to remember in prayer a friend as well as a time to plan for making some favorite recipes. She shares a great outing the family took this weekend where they revelled in the apple and pumpkin harvest. Mary of St. Athanasius Academy is also enjoying the bounty of that region. They recently relocated to an area rich in apple orchards, something quite lacking in the state they left behind. So they are enjoying the harvest of this basic and delicious fruit and tell all about the fun family trip to the orchard. With the bounty of these particular fruits of the harvest and sometimes an overabundance, it is always helpful to have some recipes to enjoy. Dawn's Apple Crisp sounds like the perfect fall treat. JoAnne has a helpful and easy to follow Apple Pie tutorial. Amazing and scrumptious come to mind with Donna's Apple Dumplings. Michele was surprised by how simple yet delicious this pumpkin bread was to bake. Pumpkins being a particular favorite at our house, I have included some of the favorite pumpkin recipes of our family. The fruits of the harvest often come in great abundance. With that abundance comes a need to preserve and save much of the fruit for the future days when the earth is barren of the fresh fruits. Jodie is new to the blogging world, her blog created especially to be able to participate in the fairs. Welcome, Jodie. She will be well prepared for the months to come considering this very complete post on food prep, preserving, and storing . She also shares a touching tribute to her grandmother, at whose side she learned the skills that serve her well in preserving and putting up the bounty of the harvest. And personally, I love the geographic reflections on living in the high desert. This is the area where I grew up and I was feeling a bit nostalgic reading it. Marci is quite a pro when it comes to putting up fresh foods. Here she shares the basics and helpful tips for a variety of food preservation methods. It's listed by specific foods. What a fun and busy place her kitchen is in the fall. Angi shares her gratitude for the generous friends and family who shared the abundance of bounty with them. This enabled Angi to can and freeze quite a bit of the frutis for future use. This site was suggested by a reader as a helpful resource for canning. We also have several contributed posts on the bounty we receive from the animals. Another fun fruit of the harvest we don't always think of is honey, which does come from a very small animal. Septmeber is the traditional honey harvest and Donna shares a great outing to an aviary watching a beekeeper in action. Just look at all that beautiful golden goodness. Trina tells us of the bounty of a successful hunt in the way only a proud mama can do. She also shares a couple recipes for enjoying this bounty. Put venison or elk roast in the crock pot with onion, garlic, Worcestershire sauce, beef bouillon & water/ or beef broth, and Seasoning salt. Cook all day, then shred and use as taco meat,Enchilada meat, put in Mexican soup, or even stew. Again put roast in the crock pot and add 2 cans cream of mushroom soup, 1 pkg. dry onion soup mix, and 1 1/2 c. water. Serve over noodles. Theresa is experiencing her first autumn in Alaska and was the recipient of a generous gift from a friend's hunting bounty. Here she shares that she is grateful for the bounty and now is looking for ideas and recipes for using it. Check the comments for some readers’ recipes. And on a final note, I wanted to share an experience that my children and I had last week when we helped to glean a farmer's field. It really brought home the idea of being thankful for our bounty and the call we have as Christians to share of that bounty. Bless us O Lord, and these thy gifts, which we are about to receive from thy bounty through Christ our Lord. Amen. We hope you have enjoyed the fair. If you have contributions to add, I'll continue to take submissions and insert them into the fair. October 11 marks a newer feast honoring Saint Pope John XXIII (his nickname was "The Smiling Pope"). His papacy was from 1958 to 1963. He died at the age of 81 from stomach cancer. He was beatified by Pope John Paul II on September 3, 2000, and canonized April 27, 2014 by Pope Francis. I found it interesting that his feast day is not the date of his death (June 3rd), but October 11, which marked the opening of the Vatican II council in 1962, the most memorable part of his short papacy. St. Pope John XXIII was born 1881 as Angelo Giuseppe Roncalli in a village called Sotto il Monte, north of Italy in the hills around Bergamo in the Lombardy region. For more information, see CatholicSaints.Info which includes a list of writings and other outside links about this pope. St. Pope John XXIII came from a long family line of hard working farmers that toiled the land, but who were also rich in their faith and kept close ties with family. It was these deep roots with Faith, family, and the land that helped him through his life. People were interested to learn that in the frescoed Vatican halls the Holy Father continued his simple way of life, dedicating his early morning hours to study and prayer, and turning in for bed early in the evening, immediately after the television news. The world found out that immediately after the conclave the pontifical tailors busied themselves letting out the sacred vestments to accommodate Pope John's stout figure, and that in the gleaming kitchens, sisters of the order of St. Francis of Assisi from Bergamo prepared dishes from local peasant tradition for him, as they had done at home for their fathers and brothers: vegetables with a little meat, occasionally cheese such as Taleggio or Robiola, and, sometimes, extravagant and delicious cheese sent from France by friends who remembered the tastes of the apostolic nuncio Angelo Roncalli. But the Pope's ultimate moment of gustatory nostalgia, with its baggage of memories, history and life experience, was when the golden-yellow polenta arrived, as it did regularly, from the Bergamo countryside, in white canvas sacks. Before the empty sacks were returned to sender, the cornmeal was turned into a magical, steaming version of sunlight, shining on the table of a very noble peasant Pope. Traditionalists say one must boil the water in a copper pot (over a wood fire). Add salt, then gradually sprinkle in the cornmeal slowly while stirring continuously, but gently. The cornmeal breaks down slowly, so stirring gently helps prevent lumps. After all the cornmeal is added, the polenta can be stirred with a little more gusto. "In the late nineteenth century and early twentieth century, polenta was used instead of bread, as a base for spreads and toppings." Polenta with Milk -- Piping hot polenta and cold milk was the traditional midday meal for country folk. Polenta "Cunsa" -- Dressed polenta was spooned out of the copper pot and served in a big bowl with melted butter aromatized with garlic and grated cheese. Polenta "Rostida" -- Roast polenta was cold polenta cut into slices and grilled in a frying pan which onion had softened in butter. Polenta "Pastizzata" -- Layered polenta pie with tomatoes, the big dish for special occasions: alternate layers of polenta, tomato sauce, sausage, minced pork and mushrooms cooking in a baking pan, finishing with the tomato sauce and grated cheese. Bake for about half an hour. One of my favorite stories involves another food connection with this Pope regarding apples. It could be apocryphal, or Father Z says it was actually Benedict XIV. I've always heard it was John XXIII when he was Apostolic Nuncio. And so, the way I heard this apocryphal story, at the time St. Pope John XXIII was Archbishop Roncalli and Apostolic Nuncio to Paris, he attended a banquet and was seated next to woman who was wearing a plunging neckline, sharing too much décolletage. During the dinner, the Archbishop kept trying to give the women an apple from the centerpiece. She politely declined several times, yet he kept insisting she have it. Finally she asked "Your Excellency, why do you want me to have this apple?" The Archbishop replied, "It wasn't until Eve ate the apple that she realized she was naked." Was this Benedict XIV or John XXIII? Probably Father Z is right, but I think since this feast day falls around apple harvest season, we can recall this story with our apple dumplings and pies. I have a dear priest friend relate while he was in seminary that several fellow seminarians would pass out apples to the co-eds sunning themselves in the common areas, recalling this story. Apples and polenta -- both are foods appropriate to this season of harvest time. Just reminder about the upcoming From Thy Bounty Fair which will be published here on Monday. The Fruits of Our Harvest (October 13): How do you give thanks? What do you do with the bounties of your harvest? Whether you grow your own, shop at the farmer’s market, visit an orchard, or hunt off the land you are benefiting from the bounties of God’s creation. Let's share our recipes, ideas, and thoughts on the bounties that God provides. I will be hosting the fair here on Monday. Submit your blog links, ideas, or pictures to me at Trail_trekkers at comcast dot net or leave them here in the comments section. Looking forward to the wonderful array of fall bounty you will share, whether it be fall menus, putting up preserves, baking, freezing, drying, or simply enjoying the bounty in its natural fresh picked state in the moment. And it doesn't have to be a post you did this year. Past posts are welcome. You adorn the year with your bounty; your paths drip with fruitful rain. The untilled meadows also drip; the hills are robed with joy. The pastures are clothed with flocks, the valleys blanketed with grain; they cheer and sing for joy. Today is the Feast of Our Lady of the Rosary. It is named so because of the Battle of Lepanto which was a great Catholic victory over the Turks on this day back in 1571. Victory is said to have been achieved due to the faithful praying the Rosary. Many families celebrate this feast with a family rosary. Preheat oven to 350 degrees. Bake potatoes for 1 hour. When potatoes are done, allow them to cool for 10 minutes. Carefully cut off the top skin of the potato. Gently scoop the flesh into a mixing bowl. Set the potato shells on a tray. Mix all the ingredients except cheese and bacon. Fill the potato shells and top with cheese and bacon. Bake in the oven at 350 degrees until cheese melts. Cut nine rectangular pieces of paper to put on the skewers in honor of Our Lady. Decorate the “sails” with blue crosses, rosaries, or other Marian symbols. Insert toothpicks in the “hull” of the potato as the oars — 10 on each side. * Note: If you are pressed for time, just decorate a plain baked potato! And with that we are back to Fatima, Portugal where Our Lady, when asked her name, said: "I am the Lady of the Rosary." At Fatima, Our Lady taught us to pray the Rosary every day. Heaven presented its peace plan at Fatima and truly gave us hope for the world. Conversions were promised at Fatima: the conversion of sinners; the conversion of Russia; and what also appears to be the conversion of Islam. Tomorrow we celebrate the Memorial of Our Lady of the Rosary and the Feast of the Most Holy Rosary. Awhile back, I ran across a suggestion (I am pretty sure it was from the 4Real Forums) for making a Cupcake Rosary! I thought it was such a great idea, and have been looking forward to giving it a try. So, in honor of this Feast, we will be meeting a couple other families at the park tomorrow, to Pray the Rosary, color Charlotte's beautiful Our Lady of the Rosary Coloring Page, and eat our Cupcake Rosary! To make the rosary, I used 6 regular size cupcakes frosted with White Frosting, and 53 mini strawberry cupcakes. I planned on frosting them, but was lazy decided not to after all. For the cross, I just cut one out of brown construction paper, but it would be really cute with a small cross cake, don't you think? And these Thy Gifts made one with all regular sized cupcakes. Living Without School made a darling Cupcake Ring. Totus Tuus Family shares a beautiful Cupcake Rosary. I loved the idea of using cupcakes for the cross as well. Mary over at Our Domestic Church has been making the Cupcake Rosary for years and shares a darling picture as well! She made this particular rosary out of mini-muffins. Not only do you not need all those tiny little cupcake liners, it is a healthier option to follow up the desserts from last weeks celebrations! OH!! Don't miss Jamie's Marshmallow and Kisses Rosary!! I *LOVE* it and I know my kids would as well. What a perfect treat to go along with some hot cocoa on a rainy day. We will definitely be using this idea sometime this month! Another option is to make a "Finger Rosary" out of cupcakes. I love the little cross cake that this Catholic mom made. Very cute! Anne shares their lovely rosary made from Marshmallows and Heart Shaped Cupcakes. It looks too pretty to eat! We also opted for Marshmallows this year, combining them with little Pecan Clusters and a Cross made from Hershey squares. You can see pictures over at Shower of Roses. I am constantly amazed by everyone's creativity! Head on over to Castle of the Immaculate to see Helen's unforgettable Rosary! 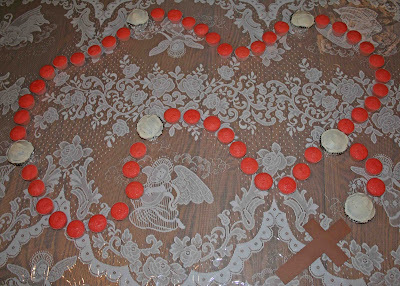 Visit Cherished Hearts at Home to see Gae's lovely "Biscuit Rosary." I hope you all have a wonderful feast! 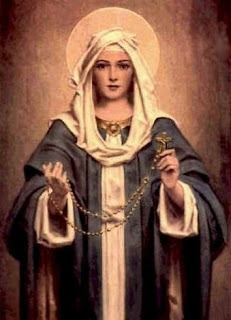 Our Lady of the Rosary ~ Pray for Us! Like many kids, when I was young I imagined I was adopted. I can recall asking my sister, who was ten years older than me, if I was. She told me flat out good luck. I looked way too much like the rest of family to even pretend I was adopted. Having to give up that, I decided I wanted to be Italian. I figured I loved Italian food so much I had to be Italian… and maybe I was… I could have been adopted after all. Over the years this love of Italian food really consumed me. Anything Italian was generally ok with me! I also began to develop my own recipes, usually variations on marinara sauces. One of our family favorites, however, has become our Sunday night pizza. There is nothing like homemade pizza and once you realize how relatively easy it is, it won’t be worth all the trouble of calling for cardboard with some tomato sauce slapped on top! Since today is the Feast of Saint Francis, an utterly cool saint I must add, I thought I would share my recipe for pizza with you! My recipe is really just a variation off my bread dough recipe. Just a little different. Roll it out, toss it on the stone (if you are lucky enough to have one) and cover it with goodness... and there you have it: PURE JOY. Let yeast dissolve in water add salt (if you feel like being fancy you can add some garlic salt instead or add a nice dried herb like basil, just don't overdo it) and oil. Add enough flour to make dough smooth and elastic (you need to make sure you do not add too much flour, as this will make it impossible to stretch out). If you have some cornmeal sprinkle it on your stone or pan, and stretch dough out to fit the pan you are using. This recipe usually can make**two to three** pizzas depending on how big you want it. Bake at 425 degrees F for about 20 minutes. Now, it is a main consensus that you need a really hot oven to make a decent pizza, but I have yet to test this. You do not know how scary a room full of five kids and husband can be when looking at a charred and burned pizza. I generally cover the dough with my homemade sauce (unless I am lazy and then I only sprinkle it with some tomato sauce), whatever is in the kitchen or garden, and some mozzarella cheese. Oh and make sure you don't overload the pizza! It will make it very hard to eat and the dough might not cook well. One of our favorite topping combos is spinach, feta, mozzarella, and tomato (I will even add pineapple sometimes). Another favorite but highly less uptown is Taco. Skip the sauce, cover dough with refried beans, a little salsa, and cheddar cheese. Cook and then cover with tomatoes, lettuce, and crushed Doritos chips. Top all that with a dollop of sour cream. That one is definitely a slice you will need a fork for!Since this is the Feast of Saint Francis you can be even more creative and toss some truly Italian toppings on that dough and sauce. Anything goes! What about Sundried tomatoes and a variety of Italian cheeses? Parmigianino and, of course, mozzarella? The key is to have fun with it! This is a pretty easy way to enjoy a great meal and generally these are all things you have around the house, so no special trip to the store! I think Saint Francis would approve! 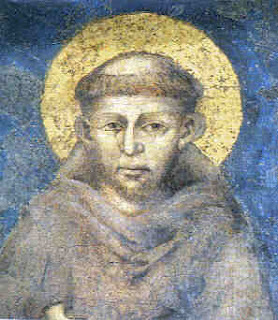 October 4 is the Memorial of St. Francis of Assisi. 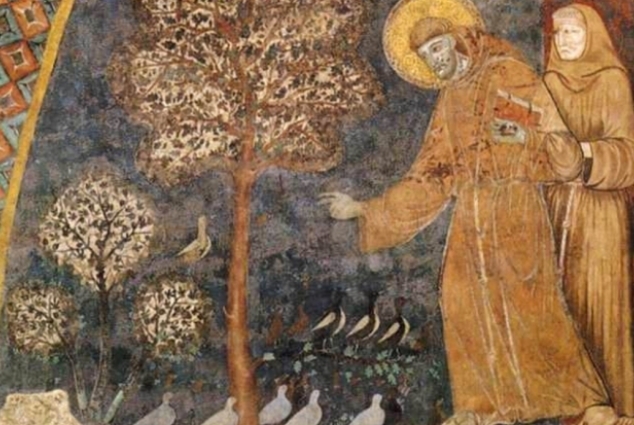 St. Francis is a most beloved saint, far and wide, even with non-Catholics. His life was simple, living the Gospel and loving Christ and His Church. Assisi is in the region of Umbria, the heart of Italy. Food delicacies such as black truffles come from this region, as do many other specialties. I'm just highlighting a few recipes that could be worked into dinnertime, with ingredients that should be on hand. On the suggested menu: Stewed Chicken and Flat Bread from Gubbio (recipes follow), Salad, Pasta such as gnocchi, and Frangipane (Mostaccioli or Paletta di Mandorla). The foods evoke a sense of the fall season, also. Francis fasted most of his religious life, so it's not completely natural to prepare a great feast in his honor. And the only mention of favorite foods comes from his death bed. The rich noble Lady Jacoba was allowed to serve Francis, and he called her "Brother Jacoba". As he lay on his deathbed, he asked her to be called, and to bring the sweetmeats known as Frangipane, a concoction of almonds and sugar, that she had made before that he enjoyed. Without being summoned she arrived shortly after he expressed his wish, with burial shroud and the sweets he requested. Some sources say he was too sick to eat them. In a bowl combine the nuts, honey, cinnamon, and egg whites. Mix thoroughly. Gradually stir in enough flour to form a thick paste. On a lightly floured surface, knead the paste until smooth and stiff. Roll out to about 1/4 inch. Cut into diamond shapes, about 2 1/2 inches long. Place the diamonds on a lightly buttered and floured baking sheet. Let dry for 1 to 2 hours. Bake in a preheated 250°F oven for 20-30 minutes or until set. Do not let brown. Frangipane today is known as a filling, Frangipane Cream. Here is a recipe from Feast Day Cookbook but there are many other versions. 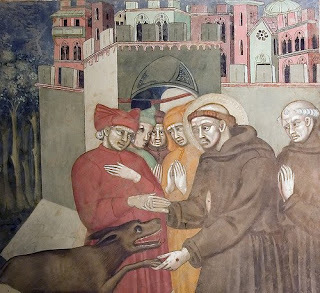 Gubbio is also in the region of Umbria, and St. Francis traveled there and helped save the town from the ravenous wolf. Remembering the dear wolf of Gubbio, here's some Gubbian recipes: a simple Flat Bread and Stewed Chicken. This is brustengo, the fried flat bread of Gubbio, fried in a flat skillet. If you make the batter ahead of time, it will thicken slightly; it should be pourable, like pancake batter, so thin it down before you use it, if necessary. Serve the bread warm as is or with prosciutto, dried sausage, and olives for an antipasto. Mix the flour, water, and salt together in a bowl. Pour the oil to a depth of 1/2-inch into a 10-inch heavy-duty skillet or frying pan and heat until hot. Test the hotness of the oil by dropping a small dribble of batter into the skillet; if it browns and bubbles immediately, the oil is hot enough. I keep a candy thermometer in the oil to make sure it is at 375° F.
Pour or scoop and spread about a cupful of the batter into the oil, and when the bread begins to brown around the edges, flip it over carefully to brown the other side. Use a slotted spoon to remove the bread and allow it to drain on paper towels. Use up all the batter in the same way. Depending on the size of your pan, you should be able to get at least 10 to 12 rounds. From Ciao Italia in Umbria by Mary Ann Esposito, published by St. Martin's Press in 2002. A fricco is a stew of sorts, and in this easy-to-prepare Gubbian-style chicken stew, it is Orvieto Classico wine that gives great merit to its flavor along with the presence of rosemary, which shows the fondness that Umbrians have for this herb in many of their foods. This dish is even better if made the day before serving. Get the olive oil hot in a large sauté pan and cook the onion over medium low heat until it is soft and translucent. Raise the heat to medium high and add the chicken pieces. Be sure they are well dried before adding them to the pan. Keep a bunch of paper towels handy for this. Cook, turning the pieces until they are browned on all sides. This should take about 5 minutes. Add the wine vinegar and allow it to evaporate. Lower the heat; add the sage and rosemary. Continue cooking over low heat for 15 minutes. Raise the temperature to high, add the wine, and allow it to evaporate. Pour in the pureed tomato juice. Season the mixture with salt and pepper and continue cooking uncovered for 25 minutes or until the juices thicken and the chicken is tender when pierced with a fork. Arrange the chicken on a platter; pour the sauce over the top. Serve immediately. From Ciao Italia in Umbria by Mary Ann Esposito. There are many great wines from this region, particularly whites from Orvieto. I'd add a green salad and perhaps a traditional gnocchi or some pasta to make a full feast day meal. These are just a few ideas to help walk a little with St. Francis. He might have been smelling the aroma of the same foods being cooked when he walked the streets of Assisi or Gubbio. A blessed feast to you. The Memorial of the Guardian Angels is October 2nd. As we had an angels' fair earlier this week, there are already many good angelic ideas swirling around for this feast day. It's a great week for liturgical feasting! But on the negative side, all these back-to-back feast days can mean an accumulation of leftover sweets -- not always good for the waistline, nor for the budget. So this recipe idea can be double duty for both St. Francis of Assisi (October 4) and Guardian Angels (October 2) (and light on the waistline). I was researching foods for the feast of St. Francis, looking for regional foods from Umbria, or directly from Assisi and found this recipe from Mary Ann Esposito, of Ciao Italia. It's a simple meringue recipe. The concept of having light, airy meringue kisses to remind us of the heavenly hosts isn't original. What makes this recipe unique is that it is an Assisi version that is a PINK meringue with sprinkles. 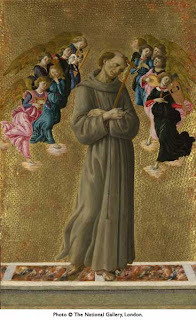 The angels connection with Saint Francis that immediately came to mind is the The Basilica of Santa Maria degli Angeli or Saint Mary of the Angels which is in the foothills of Assisi, where the Portiuncula chapel is encased. Mary Ann Esposito explains the flavoring and coloring she uses is Alchermes, an Italian liqueur, sweet, red, cinnamon and clove flavored. You can substitute with food coloring, cherry or cranberry juice. Preheat the oven to 300ºF. Prepare two cookie sheets with parchment paper or Silpat. With an electric mixer in a glass or copper bowl (free of oil) beat until smooth the egg whites and 2 cups of the confectioners' sugar together. Add the remaining 1 3/4 cups sugar and the Alchermes or other flavoring and continue beating until stiff glossy peaks form. Fit a large pastry bag with a large star tip and fill with the meringue. On the parchment paper on the sheets, pipe 1 1/2-inch star meringues onto the cookie sheets, spacing them about 1 inch apart. Sprinkle the tops of the meringues with colored sprinkles. Alternately, use a teaspoon to drop meringue one inch apart on the cookie sheet. Bake in 300ºF. oven for 1 hour or until the meringues are firm and completely dry. Rotate the baking sheets once or twice while baking. Carefully remove from the parchment paper and let cool completely on wire racks. Our Guardian Angels, protect and pray for us. Seeing Mary's adorable Angel Candy Favors the other day reminded me of the Chocolate Roses my sisters and I made years ago. What a perfect craft they would make for the feast of St. Thérèse! My children agreed! They are quite fun and very simple to make. 1. Remove the tags from the candy. Take a 4 1/2" square of cellophane. Place two Hershey kisses together, as pictured. 2. 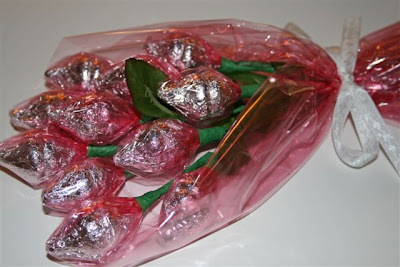 Place the tip of one of the kisses in the center of the cellophane square, then wrap the cellophane around both kisses, gathering the corners together around the tip of the other kiss. 4. Continue taping down the length of the wire until it is completely covered with florist tape. 5. If you'd like, tape silk leaves onto the stem. 6. Place in a vase, wrap as a bouquet, or display however you'd like. Enjoy! You can see a few other ideas I posted, for celebrating the feast of St. Thérèse, over at my other blog, Shower of Roses. Have a wonderful feast! St. Thérèse of Lisieux ~ Pray for Us!